YouTube user NCARalph captured this amazing footage of young crows keeping themselves entertained by swinging back and forth on a tree branch. "These are wild crows playing in our back yard north of Boston, MA, USA, swinging upside down on a willow branch and knocking each other off. I believe these are a group of young fish crows who have been playing this game a few times a week for the last couple of weeks, always using the same branch." What is the difference between a crow and a raven? 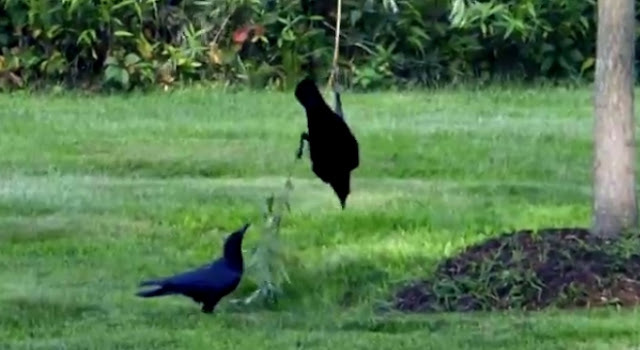 Crows and ravens, although in the same genus (Corvus) are different birds. (Think of leopards and tigers; both are in the genus Panthera, and are obviously related, but they are quite distinct animals.) The words "crow" and "raven" themselves have little or no real taxonomic meaning. That is, the Australian "ravens" are more closely related to the Australian "crows" than they are to the Common Raven (Corvus corax). In general, the biggest black species, usually with shaggy throat feathers, are called ravens and the smaller species are considered crows. Responses to "Playful Crows Swing on Tree Branch for Fun"